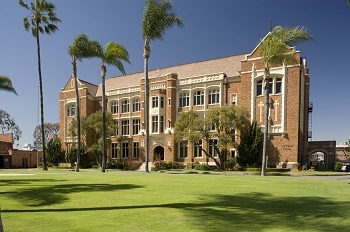 Situated in an unmarked room along the southeastern corner of the Berendo complex, the Loyola Archives Vault is home to thousands of prized records, art pieces and artifacts that constitute the 150-year history of Loyola High School. 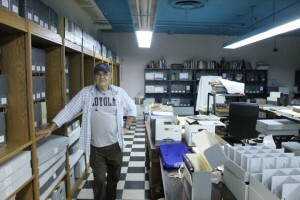 The repository, which was established in 2010 under the guidance of Loyola President the Rev. Fr. Gregory Goethals, S.J.‘73, is a consolidation point for school records that date back to the institution’s founding date of 1865. “It [maintaining archives]is important because we are one of the oldest institutions of any kind in Los Angeles, and we are certainly the oldest educational institution. We’ve got an interesting history from St. Vincent’s through Loyola, and we’ve been on this campus for 100 years but [we’ve been] a part of the community for 150 years,” Goethals said. Prior to the vault’s opening, two Jesuit priests, the Rev. Fr. Phil Connealy, S.J. ‘33, and the Rev. Fr. Robert McDermott, S.J. ‘37, managed an informal account of school records by collecting artifacts and storing them in their respective offices. Today, the vault is managed by archivist Neil Bethke, who has worked in the records business for over 20 years. Bethke holds a master’s degree in archival administration from California State University, Northridge, and has worked on numerous other historical collections. “Around 2010 was when Greg Goethals was going, ‘We’ve got the 150th anniversary coming up, and maybe we should gather all of these records together and prepare them for an author to do a formal history’….That’s when Fr. Goethals reached out to me and brought me in as a consultant,” Bethke said. 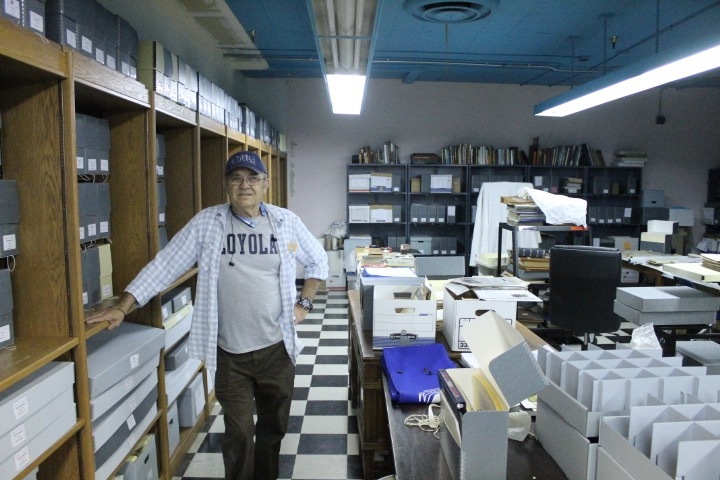 Upon his arrival to Loyola, Bethke implemented a formal archives collection system, which oversees the gathering of archives from the moment of recovery to the point they are officially added to the records stock. He also decided that he wanted to secure all of the school’s historical evidence shortly after joining the Loyola staff. “Basically, my goal is to get everything boxed with a label on it. It may seem like that is ‘captain obvious,’ but there is actually a whole bunch of stuff that goes into trying to organize all of this stuff,” Bethke said. To organize the archival collection, Bethke has established seven categorical groups where historical files can be placed. These sections include administrative affairs, academic operations, business operations, student life, athletics, the Jesuit community, and campus ministry/student service. According to Bethke, developing the archives is significantly easier once these groups are instituted. “That’s what we had to do first––to understand what the big functioning things on this campus are. Once that’s established, then it’s pretty easy to go to a specific box and identify it as a certain record,” he said. To further classify the archival collection, many of Loyola’s artifacts are distributed throughout campus: While the paper records are located in the Berendo vault, many of the photos are stored in the Ruppert Hall library, and the trophy collection is located in the Xavier Center foyer. Any other miscellaneous items are directed toward the Berendo vault, which holds “around 1,000 linear feet of archival material,” Bethke said. Although the current vault is spatially appropriate, its lack of temperature control is detrimental to specific items, according to Bethke, who is forced to store old video films in a refrigerator on the storehouse’s north side. “We are elaborating the statement that this [vault]is here temporarily, but this [location]is not ideal….In an ideal world, you want to keep the material– whatever it is–at a cooler temperature and stable,” Bethke said. Plans are in place to develop a new archives hall in the Burns library that will serve as a central hub for all of Loyola’s archives. Bethke hopes that the new center will open during next spring or early summer. He is currently working to identify donors for the project, and he is continuing to prepare all items for transport. Bethke, stressing the “urgency of preserving or saving the historical Cub record,” also said that one of his goals in transferring the archival pieces is integrating student help, whether it be through service hours, JUG, or teacher assistants.